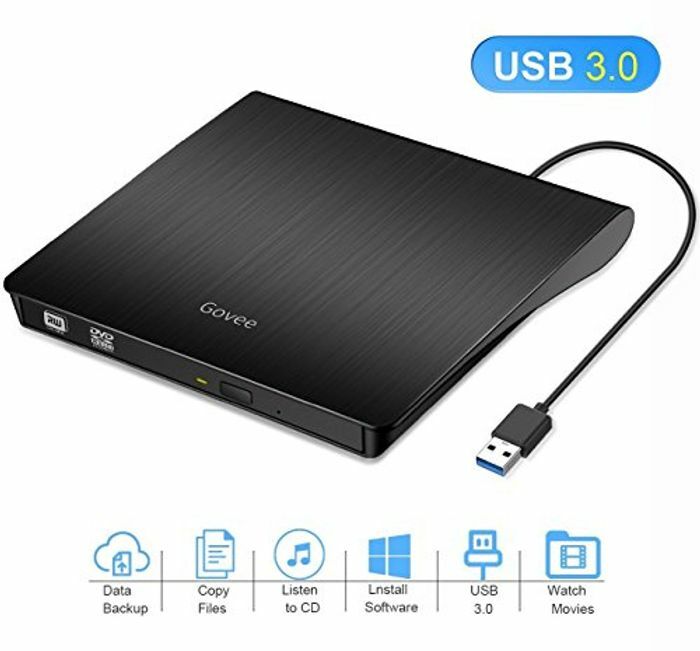 【USB3.0 High Speed Transfer】With Advanced USB3.0 Technology, the External CD DVD drive provide more stable performance and higher speed data transfer up to maximum of 5Gbps. Backwards compatible with USB2.0 and USB1.0. 【Wide Compatibility】The external cd rom works with Windows xp/2003/win7/win8/win10/Vista7,Linux,Mac. Specially designed for Apple Samsung ASUS HP Dell Sony Acer and other Macbook, Ultrabook, Notebook Chromebook or Laptop PC without drive hardware. 【Intelligent Function】Govee DVD drive supports all major DVD types and models DVD+R, DVD-R, CD-ROM, DVD-ROM, CD-R, CD-RW ect. DVD maxium read and write speed 8X, CD Max 24X.No need to download other software, you can burn a file(music, photo) through external cd drive directly. 【Plug and Play】Plug this DVD drive into your usb port and it can be recognized immediately by Windows Mac Linux, no drivers are required to be installed. Note: Please make sure you have a media player like VCL in your computer. 【Compact Design】The embedded cable design makes external cd drive much easier to carry around and no worry to lost cable again. The 1.6cm ultrathin makes it slim and portable. Govee External DVD CD Drive includes 1-year warranty and 24 hours customer service.